Hello! I'm Jen and I design fun modern sewing patterns that give a nod to classic vintage attire, with beautiful detail and clean drafting for a gorgeous fit. 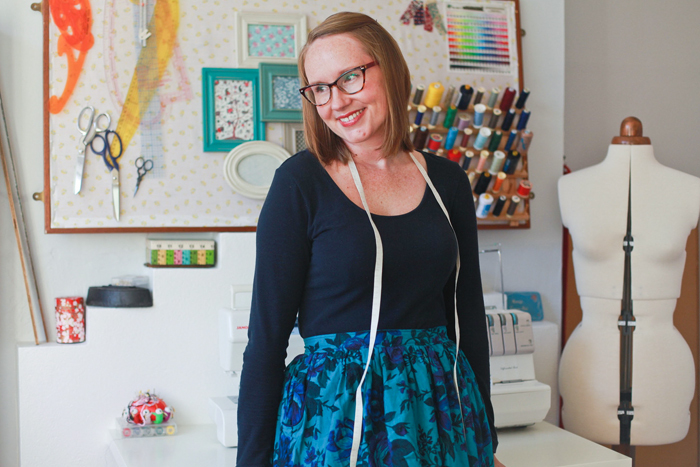 Built on form-flattering basics and using classic lines, each of my sewing patterns is easily adaptable for women of all shapes, sizes and skill levels. I love spending time creating things with my hands and sewing is a big part of that - I truely believe that there isn't one 'right' way to do it. With this in mind, I take the extra time to guide you through building your own beautiful wardrobe piece by piece by giving clear, concise instructions with all sewing levels in mind. Whether you're a beginner or an experienced seamstress, my patterns and tutorials will help you through the steps of building a form-flattering wardrobe that is fun, bright and uniquely you. If you can't find me tucked away in my cosy little sewing room, I'm probably out hunting for our rogue chicken's eggs with my little fellow, tending the weeds around the fairy houses in our garden, or baking up delicious treats in our tiny kitchen. Won't you come and join us?